Media usually presents obsessive-compulsives with very obvious compulsions: hand-washing is a favorite but also extreme organization and hoarding, as well as checking and counting. But not all compulsions are so easy to see. In fact, some compulsions are so difficult to recognize that it lead to a misnomer– Pure Obsessional OCD. 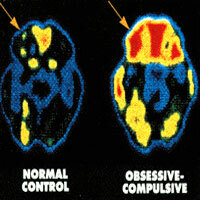 The name Pure-O leads some to believe that this type of OCD can essentially drop the “C” from its acronym. But that would be a mistake. Pure-O’s still have compulsions– they are just harder for the public to notice. They include mental rituations like repetition, avoidance, and seeking reassurance. I would have an intrusive, blasphemous thought– which would cause me to question my salvation. I would repeat a particular prayer over and over in my head to ward off this thought, and I would ask everyone if they thought I was going to go to hell (sometimes this would be active– “Do you think I’m going to hell?”– and sometimes passive, as in “I’m scared I’m going to go to hell” and waiting for that person to reassure me … “Why would you think that?! No way!”). I would also avoid certain things (Matthew 12 and Mark 3, for example, or movies with profanity, which would trigger my blasphemous thoughts). Sometimes it was hard to really focus on a conversation I was having because there was another entire conversation happening in my head at the same time. It’s like listening to two tracks at once. So … yeah. There are compulsions you would never know are there, except for the strange look in my eyes, the odd shake of my head as if I were erasing something dark and secret. This entry was posted in poetry, Pure O, spiritual life, unforgivable sin and tagged OCD, poetry, prayer, real life, sin, spiritual life, unforgivable sin by Jackie Lea Sommers. Bookmark the permalink. what is your take on mental illness? Do you think in general it is spiritual, physical; a combo of both? I understand the mental acrobatics that you go through in your mind. I also suffer from mainly pure-o compulsions that I keep trapped inside my head. Most of them are regarding religious ideas that I can’t seem to get figured out enough for them to not cause a great deal of anxiety. I doubted my salvation for several years–and I have to say it was one of the most horrible experiences in my life. The only thing that enabled me to finally overcome this was to viciously cling to the truth from God’s Word that “salvation is of the Lord.” It’s not dependent on anything I could say, do, pray, etc., but is only a mere resting in what God has already done for me. I just wanted to say “thank you” for sharing with such honesty and to encourage you with the knowledge that there are other people out there who understand and feel your pain. I can relate so much to this post. I, too, had huge problems with repetitive prayers and doubts about my salvation, doubts about God, etc. It was horrible. I totally “get” the way you’d have to try to carry on a “normal” conversation while so much junk was swirling in your head.